This piece was a request from the wife! 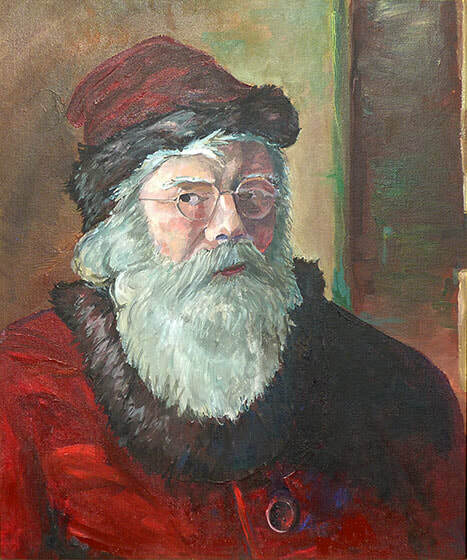 As collections manager/ big cheese (whatever her official title is these days at Luton Museum) she wanted a painting of Santa Claus to adorn the walls of Wardown House Museum and Gallery. Now the theory was this would sit amongst the regular “proper” art on the walls already as a bit of gag. Quite a challenge as there are many high quality paintings on display. Does one take a cartoon- style approach where a brightly coloured piece might bring joy for standing out from the norm or does one do something that at first glance blends in with the regular pieces but something is slightly amiss. I plumped for the latter although the potential for being ‘shown up’ in front of such esteemed company is quite high. I developed the idea slightly further by copying a self-portrait of the artist Theodor Kern who is well represented in the main corridor area of the museum. I say copy – of course I mean give him a big white beard and big red santa outfit – Victorian style. I am yet to see if this piece will sit alongside his portrait or replace it for the seasonal period. Although less people might get the gag, I think the latter would be my preferred solution. Not keen to take a fee for this one:- It feels wrong some how. Though maybe costs for materials would be OK. That includes a £5 mirror (customised for the gold frame) canvas and paints. Yet to see how this all goes down with the museum staff and visitors. Fingers crossed.